New Donald Trump 2016 Ad - "Why"
Donald Trump's campaign has released a new ad called "Why." Path 1 for Donald Trump to win is: Florida, Pennsylvania, Ohio, Arizona and Nevada. Path 2 for Donald Trump to win is: Florida, Pennsylvania, Ohio, North Carolina and Arizona. Path 3 for Donald Trump to win is: Florida, Pennsylvania, Ohio, North Carolina and Nevada. Path 4 for Donald Trump to win is: Florida, Ohio, North Carolina, Arizona, Colorado and Nevada. Path 5 for Donald Trump to win is: Florida, Pennsylvania, Ohio, Arizona and Colorado. Path 6 for Donald Trump to win is: Trump wins Florida, Pennsylvania, Ohio, North Carolina and Colorado. Path 7 for Donald Trump to win is: Florida, Pennsylvania, North Carolina, Arizona and Colorado. All of these paths have Donald Trump winning the state of Florida. 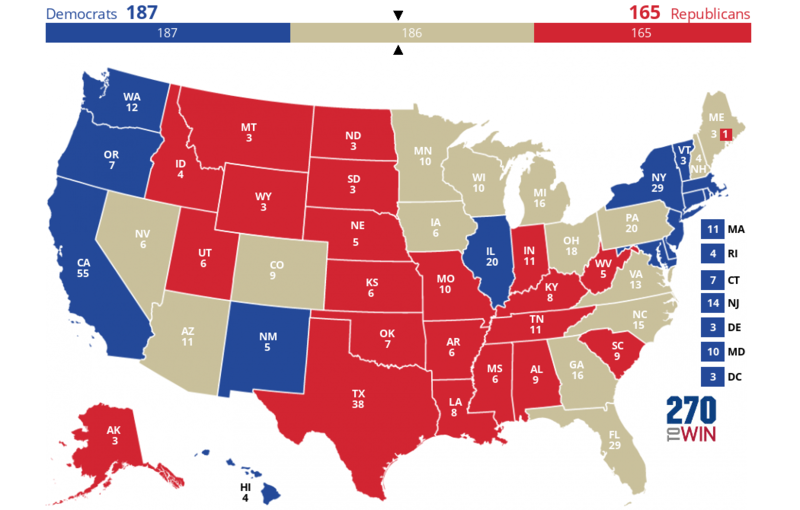 However the Washington Examiner does not consider Wisconsin (10 Electoral votes) and Michigan (16 Electoral votes). Many pundits do consider these two states as swing states and this could provide more paths to victory for Trump. Donald Trump for President rally in Bedford, New Hampshire at the NH Sportsplex. Donald Trump for President rally in Waukesha, Wisconsin at the Waukesha County Expo Center. Donald Trump for President rally in Melbourne, Florida at the Orlando Melbourne International Airport's AeroMod Hangar. With 41 days until election day the electoral map continues to move into Donald Trump favor. The latest RCP map has moved the state of Minnesota from the Lean Clinton Column to toss up. As it stands now, Donald Trump has 165 solid electoral votes and Hillary has 187 solid electoral votes with 186 electoral votes in the toss up column. Donald Trump went on Fox and Friends to talk about his debate performance the night before. Watch the first election 2016 Presidential debate between Donald Trump and Hillary. The debate was moderated by NBC Nightly News’ Lester Holt. Donald Trump talks to ABC News' Tom Llamas after the first presidential debate. Donald Trump answers some questions from CNN. After the debate Donald Trump did a quick interview with Sean Hannity. Donald Trump rally in Roanoke, Virginia at the Berglund Center. Gennifer Flowers is a former Arkansas reporter who during the 1992 Presidential campaign came forward and made the claim that she was having an affair with the Democratic Presidential nominee Governor Bill Clinton. Bill Clinton at first denied the accusation, but later admitted to being involved with Gennifer Flowers. Recently. Shark Tank star and billionaire Mark Cuban wrote on Twitter: "Just got a front row seat to watch @HillaryClinton overwhelm @realDonaldTrump at the "Humbling at Hofstra" on Monday. It Is On !" Today Donald Trump wrote the following on Twitter: "If dopey Mark Cuban of failed Benefactor fame wants to sit in the front row, perhaps I will put Gennifer Flowers right alongside of him!" Within hours Gennifer Flowers tweeted the following: "Hi Donald. You know I'm in your corner and will definitely be at the debate!" So it appears that we will be seeing Gennifer Flowers at the first 2016 Presidential debate this Monday. After a week of polls showing Donald Trump winning across the country, the media tried to reignite an old issue to try to stop the Trump momentum. The media tried to bring up the Birther issue again, hoping it will derail the Trump campaign. However Donald Trump responded and took the wind right out of their sail. He said Obama was born in this country and threw it right back at Hillary saying she was the original person who started up the idea that Obama was not born in America. Donald Trump for President rally in Miami, Florida at the James L. Knight Center.